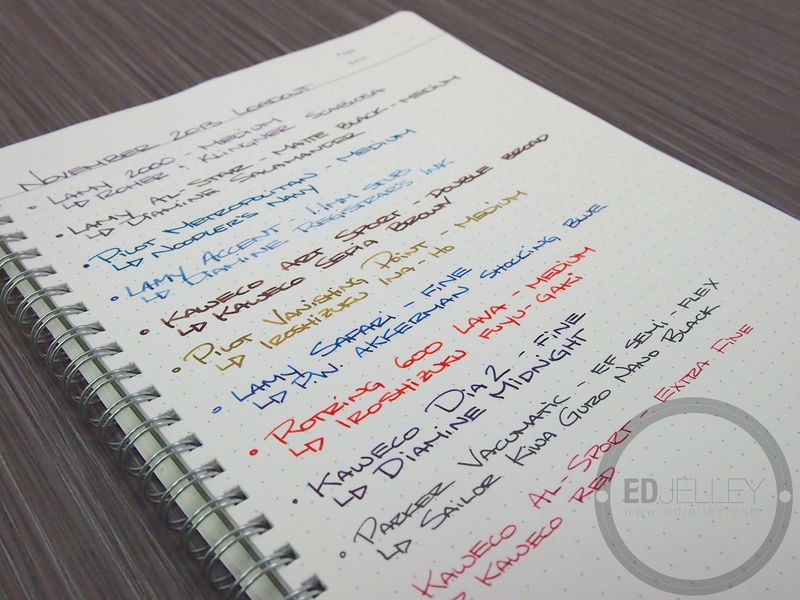 Another day, another Iroshizuku is loaded up for review (I wish there was really one per day…). The time it’s Fuyu-Gaki, which translates to Winter Persimmon. 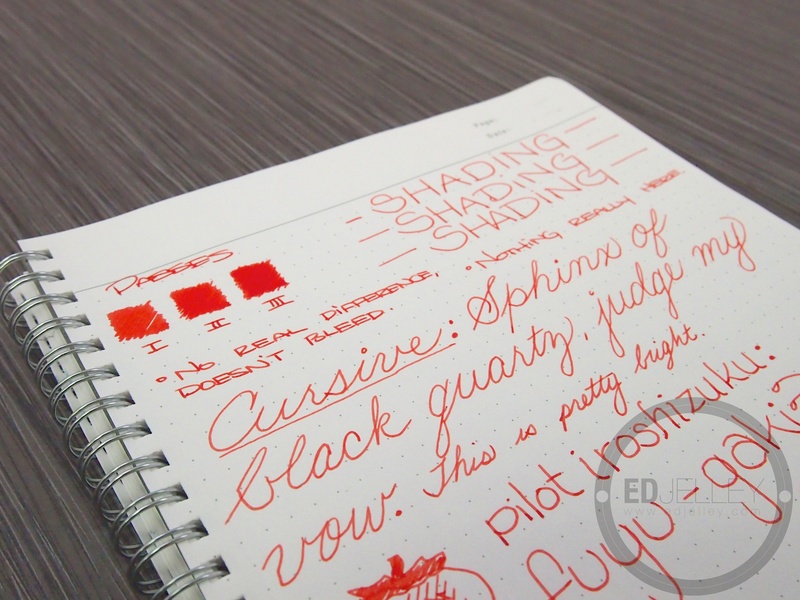 This ink should not be confused with Yu-Yake (the other Iroshizuku orange) because of their similar name and similar color. Orange is one of my least favorite colors, not just for ink, but for life. I actually don’t mind this one though. 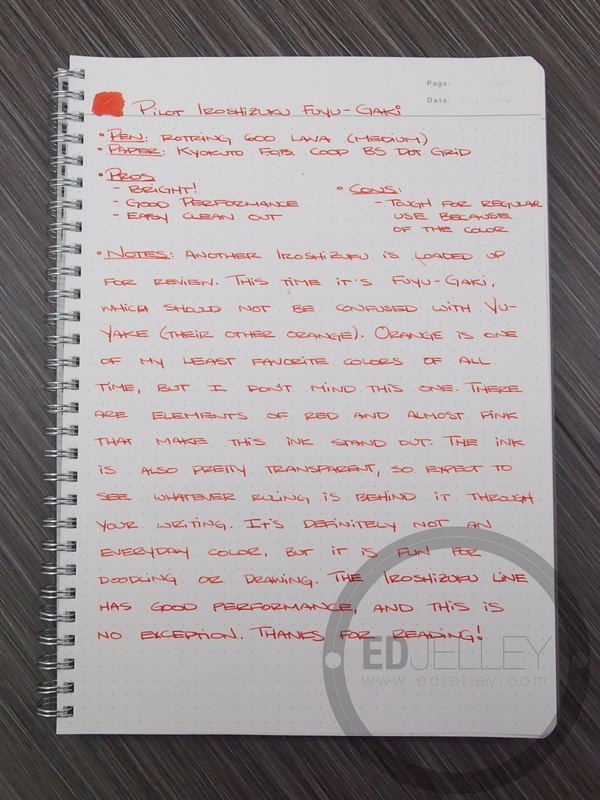 There are elements of red and almost pink that blend with the yellow to make this ink stand out from the rest. It’s elevated above a standard orange. 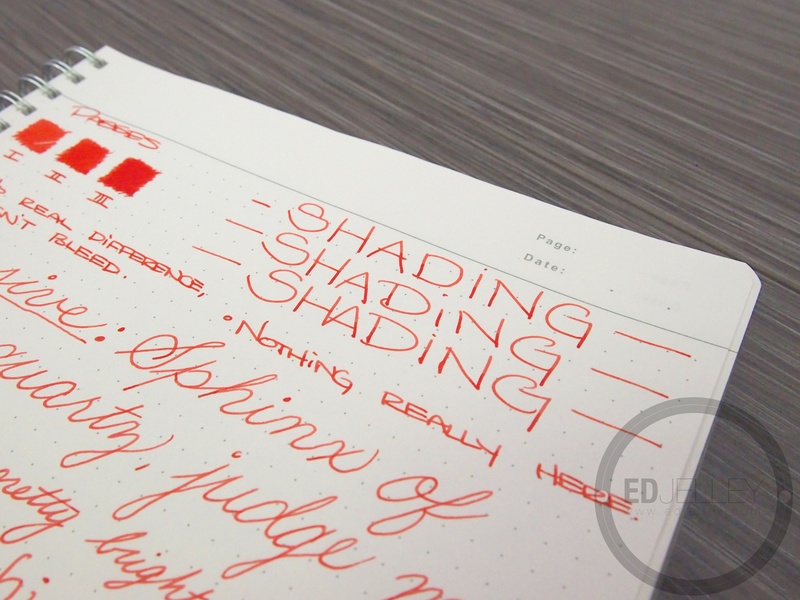 The ink itself is quite transparent, so expect to see the ruling on the page through your writing. It’s definitely not an every day use color, but it is fun for doodling or drawing. It may even fit in as an underlining ink. 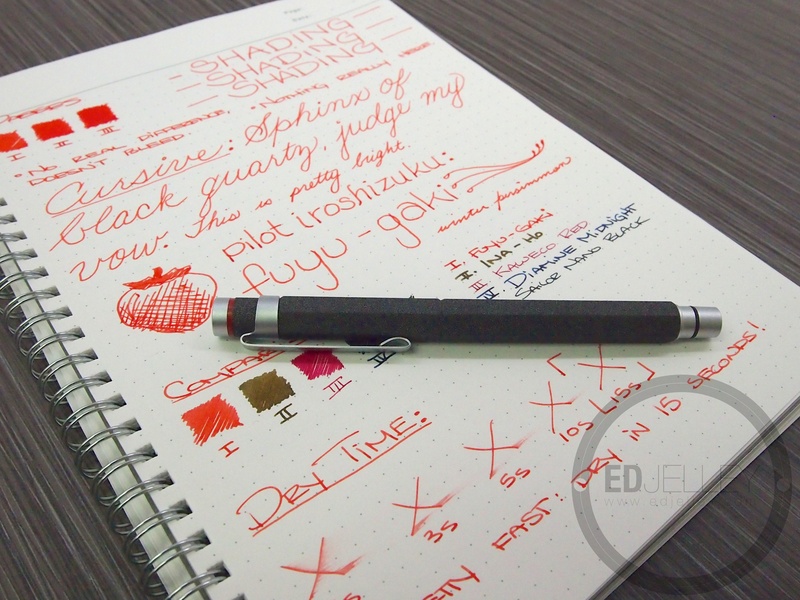 The Iroshizuku line has great performance across the board, and Fuyu-Gaki is no exception. While I don’t think I’ll be adding a bottle to the collection, I’m definitely enjoying the sample.  Well done Ed on the review and the new layout. Much cleaner than the previous version. It seems lately so many blogs are trying to cram so much in our face that it’s hard to find the real content. Your opposite approach is refreshing. The more minimal, the better. I find that this theme puts more focus on the content than it does on the other junk. I’m really happy with it so far. Great review. I beat you to it by a few days http://peninkcillin.blogspot.com/2013/11/iroshizuku-fuyu-gaki-giveaway-winner.html but I think I like your review better. Yours is great too! I added a link to the “Related Reading” section underneath the post. Boy Ed, I fell hard for that one! From what tradition does the wonderful “Sphinx of black quartz, judge my vow” arise? Surely this mysterious oracle is a hallowed delphic supplication invoked by ancient worthies to seek the blessing of Fortune on their enterprises? I am spectacularly wrong, of course, but my enjoyment of this pearl is not diminished one bit by its prosaic (yet miraculous) pangrammatical origin. That just adds to the thrill of discovery. It’s like the twist at the end of a great movie–it’s thrilling to be surprisingly mistaken. This is why I resist the urge to consult a master list of pangrams. I hadn’t visited your blog in a while, and when I stumbled upon this post, I had forgotten you already surprised me in this way once before. If history is a reliable guide, time will dull my memory and you will surprise me again with another clever pangram. 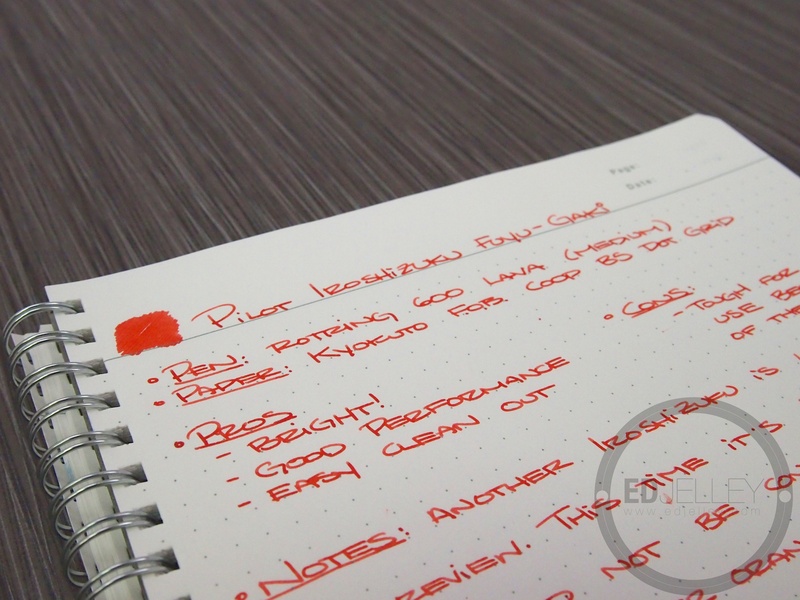 I do like the new spare layout, and your cursive as always is very fine. 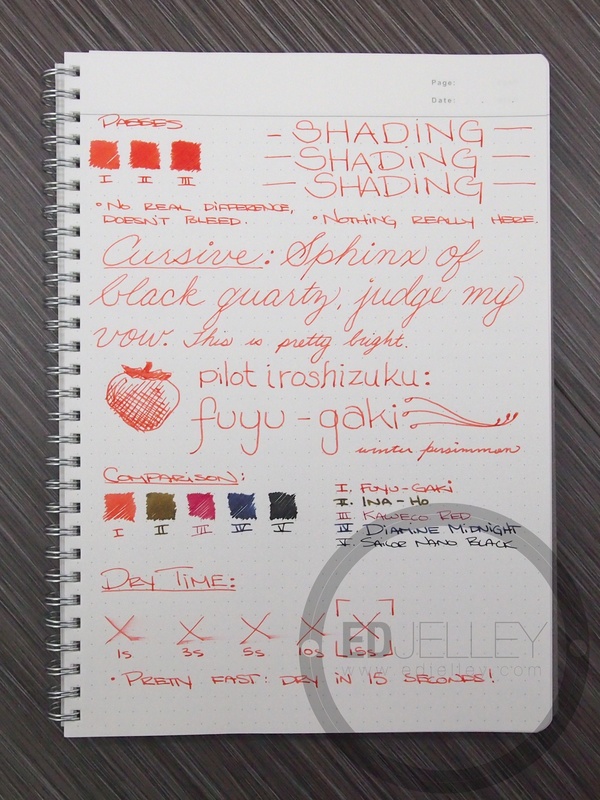 Have you ever put together swatches of all your Fuyu-gaki inks and samples on one page? They are glorious, subdued and rich. It’s actually the English pangram that Adobe uses to show off their fonts. It definitely sounds a lot cooler (albeit, more ominous) than the fox and the dog. I figured they needed a break! I have not, unfortunately I tend to do the ink reviews months apart, and photo conditions aren’t always exact. 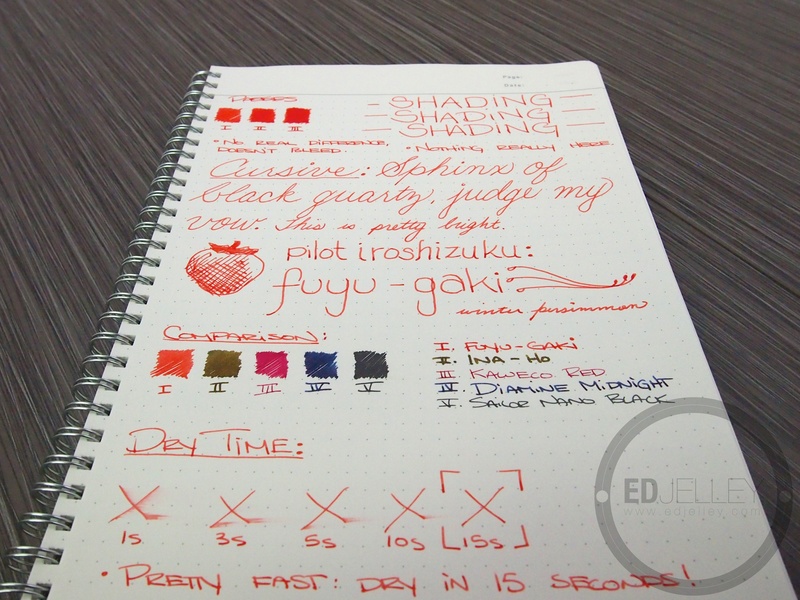 I could do a sort of Iroshizuku round up post that could be interesting. 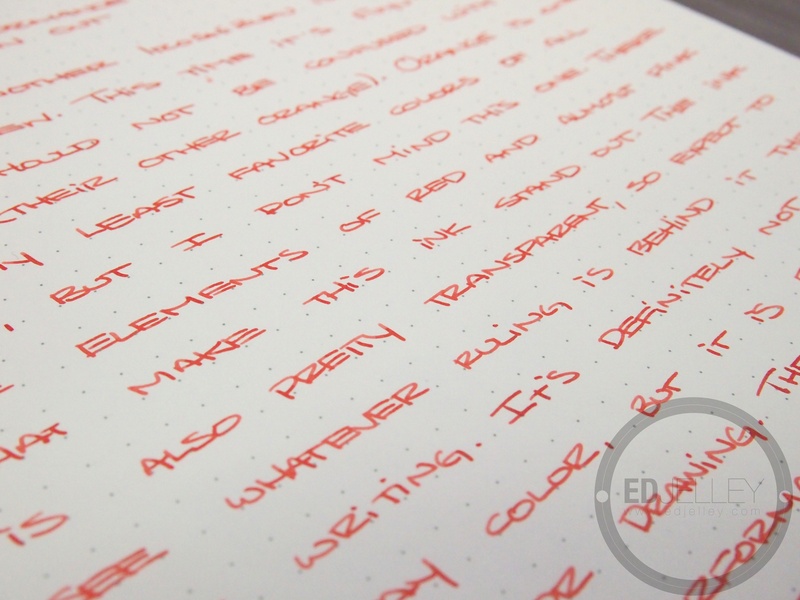 I drool just thinking about this ink… persimmon. A ripe persimmon really looks like this. Mmmm. Never had a persimmon, always pass them by when I see them. Thanks again for all the ink samples, they’ve been keeping me quite busy. So far, I’ve liked all of them!